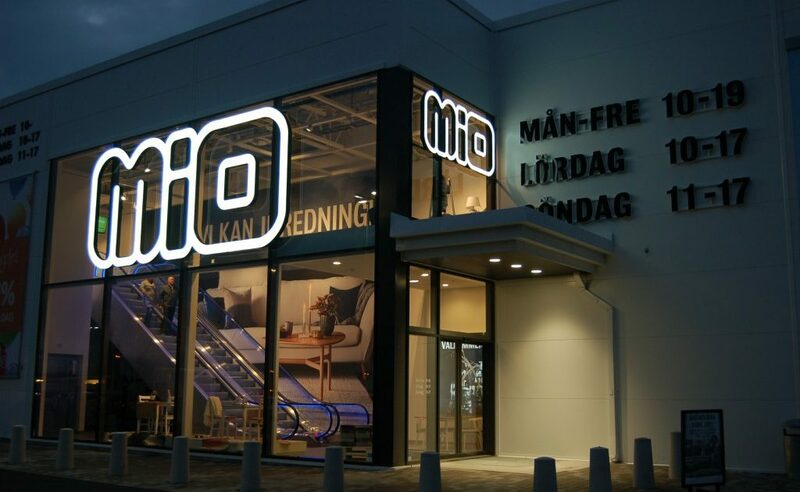 The Mio furniture chain continues its expansion on the Swedish market and in 2016 will open five new stores around the country. 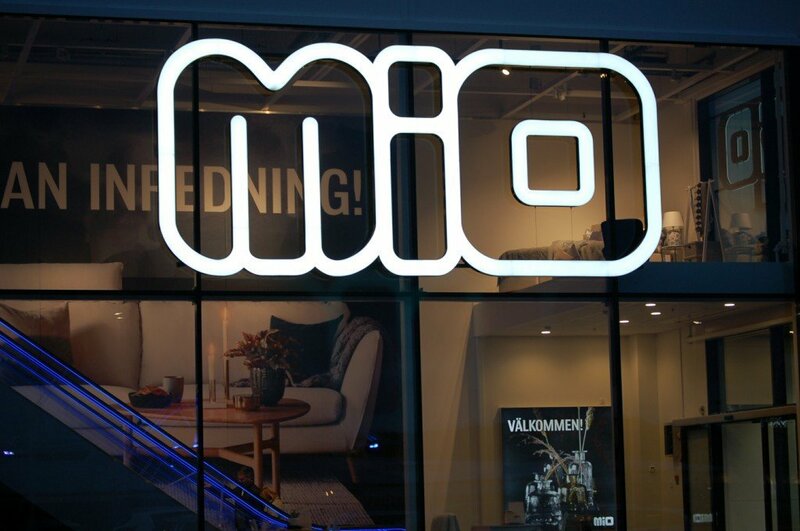 FocusNeo is proud to be part of the development and gain the confidence to supply exterior signage to Mio, including the newly opened shop in Kungsbacka, outside Gothenburg. The Mio chain’s latest addition is located in the trading centre of Borgås, just north of Kungsbacka. The trading centre is steadily growing, and the Mio store is housed in a newly built commercial complex, which is shared with Rusta, the gym chain Nordic Wellness, and others. As usual in large commercial centres, visibility at a distance is important for a store. The challenge is to provide customers with a benchmark, which immediately puts the store in focus, and helps them to find their way. The building’s facade and design also play a vital role and it is important to find exterior signage that provides maximum visibility and reflects the brand in the best way. The Mio store has a large glass entrance, and an elegant solution was required, to give the store a lift and a modern expression. FocusNeo developed an exterior signage concept for the entire store in Kungsbacka. The concept includes various fascia signs, entrance signs and simpler signs that help customers to find their way to the goods collection point, etc. The new signs reflect the brand’s profile in all other areas such as website, advertising and direction signs inside the stores. Above the entrance Focus chose to mount two signs directly on the glass section. A latticed logo placed directly on the façade is architecturally better for the whole of the property and, in addition, lets in light during the daytime when not all of the window is covered. It has an elegant expression and reflects the store’s image in a harmonious way. The sides of the logo are painted black to enhance visibility in the daytime, while the white front panel gives a crystal clear night-time effect. The two signs above the entrance are based on the design and technique that we call Contrasta LED.. The technique draws the logo’s outline and the source of light is positioned in the profile. The signage profile provides a razor-sharp day and night effect, whereby the contour is perceived as white during the day and the front glows white during the dark hours. The LED lighting is from GE, which is one of the world’s largest manufacturer of LED systems. The white-illuminated LEDS provide a sharp, clear and even light all the way out to edge of the lettering.